Retail Price:$645.00 Multiple licensing options for individuals, schools and districts are available. Schools and authorized agencies can purchase single user copies for students with an IEP for $295. Texthelp’s Read&Write Gold for Mac, Version 6 combines several useful applications in one customizable floating toolbar (see below). This software bundle has something to offer users of all abilities, from high achievers to those struggling with dyslexia. The latest version supports the Chrome browser in addition to Safari. Plus, it offers enhanced PDF Aloud and Daisy readers and improvements to its phonetic spelling checker and word prediction. Texthelp’s Read&Write solutions are available for Macintosh, Windows, and iOS platforms. Version 6, the latest release for Macintosh provides instant access to digital aides for writing, reading, research, and study from a redesigned toolbar. Apps include text-to-speech read aloud, spelling checker, dictionary, picture dictionary, verb checker, screenshot reader, language translator, fact finder, calculator, word prediction, and more. Version 6 adds new free options such as downloadable high quality Nuance voices, and helpful Video Tours. It also integrates support for spell checking, word prediction and text-to-speech read alouds in Apple’s TextEdit text editor. A new Fact Folder helps students gather and cite Web-based information and pictures for use in class assignments. Students also can take advantage of Read&Write Gold for Mac features from within Google Docs if they use Google’s Chrome browser. While Texthelp claims Version 6 for Macintosh offers enhanced support for Firefox, I could not get Read&Write Gold for Macintosh to read aloud text selected on a Web page open in Firefox. Texthelp Tech Support explains that the Firefox problem surfaced in the browser’s most recent update, Firefox v30, which has affected Read&Write's ability to read text and other tools. The Texthelp development team is working on an update and recommends using either Safari or Chrome instead (see below). Read&Write Gold for Macintosh contains about two-dozen tools that present in an always-visible toolbar. Only the tools most relevant to a particular task display. Task modes include: Speech, Reading, Writing, Research, and Study Skills. Users can further customize each toolbar, adding or removing the apps that display to suit individual work styles. Online help for setup, program use, and toolbar customization is available from within the program or directly from the Texthelp site online at http://readwrite.texthelp.com/rw6mac/help/ReadWriteMac/Index.html. All text in the online help guide can be read aloud by the program. Movies can be watched in streaming mode or downloaded to the local computer for display offline. The strength of Read&Write Gold for Mac is the sheer number of useful tools integrated into one program toolkit. One benefit of providing omnipresent tool access from a floating toolbar is that students can continue working within a software application with minimal disruption. Users can customize features and preferences. For example, in the setting for Appearance, users can choose larger or smaller font sizes for display and different speech foreground and background colors. They also decide which colors the program uses for spelling errors and “sound like” words, which voices to use, and whether the voice speaks words, sentences, paragraphs, or letters as they are typed. Pronunciations for words read-aloud incorrectly can be changed. The Fact Finder tool can be customized to use the Google, Bing, or Wikipedia search engines. One of my favorite Read&Write Gold tools is the Screenshot Reader. Use Shift-Command-4 to take a screen shot of a selected region of the computer screen, then open the shot in Apple’s free Preview, and use the Screenshot reader to draw a rectangle around the text you want the program to read aloud. Screenshot Reader automatically reads the highlighted text. The Study Skills toolbar features several colorful highlighters that you can use as you read the text in a word-processed document or a page on the Web. After you finish reading, click the Collect Highlights button on the toolbar to have the program gather your selections for use elsewhere (see below). Read&Write Gold for Mac tools are designed to support students while they work. With the Research Mode toolbar selected, the student can highlight the text in the open document, click the Fact Finder icon on the toolbar, and let the program conduct a Web search on the selected text. A new Fact Folder option lets students add notes and pictures from the visited Web site. Prediction is another important tool that students can access as they work on a writing assignment. Once they activate the tool, they can choose from a list of word suggestions as they type. While the Read&Write Prediction is not as robust as word prediction with Don Johnston’s Co:Writer 7, students who find writing difficult or students who are English language learners will appreciate how it can help them get their ideas into written form. 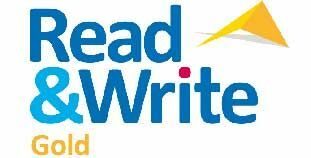 Read&Write’s Speech Maker tool enables youngsters to create an MP3 file from text selected in a document. When Read&Write Gold processes the text, it generates an audio file in MP3 format that automatically saves to the iTunes Music library for reading aloud. This tool could be very useful to students who want printed or online lesson handouts and other documents in audio format. The latest version of Read&Write Gold for Mac adds support for Google Docs via the Chrome browser, a feature useful for schools that have adopted Google Apps for Education. While it does not read aloud Doc, Sheet, or Slide contents, it will read aloud items on the Google Drive interface, including document titles and menu options. The Read&Write Prediction tool works from within Google Apps, as does Picture Dictionary. If you double-click an image retrieved by Picture Dictionary that image will paste in your document at the cursor insertion point. Finally, Read&Write for Mac’s helpful Video tours can be downloaded to local computers. Schools with limited bandwidth will appreciate this feature because it will minimize videos streaming from the Texthelp support site. Read&Write Gold for Macintosh scores high marks for bundling a full range of reading, writing, research, and study skill tools in one elegant toolbar. Tools can be customized to adapt to individual student needs.